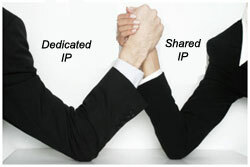 Does having a Dedicated IP vs a Shared IP Address mean Higher Rankings? No. We just received a quote from an SEO firm that wants us to move our hosting from a shared IP provider we've had for years to their own dedicated system and provide us a unique IP. They've been pretty insistent on this and have even said that the move will immediately improve our search engine rankings. Is this true? Answer: We published a couple of brief bytes several years ago talking about some of the benefits we were seeing at the time concerning dedicated vs shared hosting AND why we thought shared IP addresses were a bad risk, overall. But as we said in those articles, having a unique IP address won't improve your rankings and frankly that's still the case today. Further, as with most things in SEO, the landscape for shared hosting and the perceived "risks" it involved has changed considerably. Your site is running slow and even though you've implemented multiple site speed increasing tips, it's your shared server that's to blame. You run several sites on the same server and some of them may not be the highest quality. If one gets hit, the others are likely to be singled out as well (spam drifnet or mini-site concerns).